*CoSM’s Gallery hours vary during events. Visit the Event Calendar to check event schedules. , Chapel of Sacred Mirrors? The mission of CoSM, Chapel of Sacred Mirrors is to build an enduring sanctuary of visionary art to inspire and evolve the creative spirit. CoSM is a church, a context for a community that honors and practices art as a spiritual path. CoSM offers a visionary cultural nexus to empower a global community. To further the spiritual practice of art, CoSM offers workshops and cultural programs. At CoSM, we celebrate commitments of love and passages of consecration. CoSM hosts weddings, baby blessings and memorials. Overnight stays can be reserved in Grey House every night of the year. Day visitors are welcome Friday, Saturday, Sunday and Monday. Grey House is filled with art and altars. The Wisdom Trial through the woods features natural beauty, altars, a labyrinth, a reflecting pond, murals and sculptural installations. Entheon, CoSM’s sanctuary of Visionary Art, is now under construction. Entheon’s experiential exhibition and sculptural exterior is targeted to open in 2017. This sculptural building designed by the artist, will exhibit Alex Grey’s Sacred Mirrors and other well-loved works of Visionary Art. Narthax Gallery at Entheon will feature the works of the finest mystic artists from around the world. Come see the progress in building this unique multi-dimensional and multi-. Follow the Entheon Builders Blog at cosm.org. CoSM offers an inspiring destination for souls seeking to align with creative source, co-create a mighty force field of compassion and manifest sacred space together. Full Moon Ceremonies – Celestial Celebrations – Art Church – Visionary Salons – M.A.G.I., Mystic Artists Guild International. Full Moon Ceremonies began in January 2003, calling together like-minded visionaries to pray for a temple of Visionary Art. Mystic Artists Guild International — MAGI offers a curricula fusing creative expression with spiritual practice. The purpose of MAGI is to form a higher social organism of inspired minds capable of building sacred space together. At Celestial Celebrations, the Equinoxes and Solstices, we align with the seasonal energies and the phase shifts of the soul. Expect ecstatic music, dance and art at these night-long multi-media, interactive ceremonies. Deities and Demons Masquerade Ball, held on Saturday before Halloween, is a CoSM tradition dating back to 2004. Addressing the subject of mortality from a multi-cultural perspective, the inner light or shadow nature is creatively revealed. — Send a prayer on the Full Moon for the Chapel of Sacred Mirrors. — Receive our prayer sent to you every Full Moon for your wish fulfilled. — Become a member. Annual membership is a vote for the future of CoSM. The heart of CoSM, the Sacred Mirrors, by Alex Grey, are a series of twenty-one artworks examining the body, mind and spirit in rich detail. The Sacred Mirrors have been displayed throughout the world and the book Sacred Mirrors: The Visionary Art of Alex Grey, translated into nine languages, has sold well over 100,000 copies. 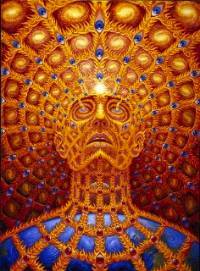 The CoSM permanent collection, renowned for integrating both scientific and spiritual truths, includes more than fifty works of painting and sculpture by Alex Grey, Allyson Grey and a growing collection of contemporary sacred art by accomplished visionary artists. With your financial support, Entheon, a sanctuary of visionary art, completion target: 2017, will provide an inspiring experiential display of the Sacred Mirrors and Progress of the Soul series’. Building the Chapel of Sacred Mirrors, the permanent home of the collection, is planned for 2020. The inevitable consequence of love is the building of temples. A magnificent 28-foot sculpture, “Altered State” by Kate Raudenbush, stands in CoSM’s meadow, offering a spiritual centerpiece for events and ceremonies. In 1986, Allyson and Alex Grey had a vision that the Sacred Mirrors, along with other works of visionary art, should be housed in a contemporary Chapel and made available to the public. The Foundation for the Chapel of Sacred Mirrors Ltd. was formed in 1996 as a non-profit charity and began raising awareness and funds to open the Chapel. In 2003, the Grey’s began holding Full Moon prayer ceremonies in their Brooklyn home. What started as a circle of friends widened, and has become an ever-growing community. With this support, the first CoSM opened in New York City on the autumnal equinox of 2004. Monthly interfaith celebrations were held on the New and Full Moons. As a center for visionary culture, CoSM presented workshops and lectures by leaders in the fields of art, science, and religion. The Entheocentric Salons—featuring live painting, world famous DJs, VJs, and dance performances, were inspiring celebrations of all the creative arts. 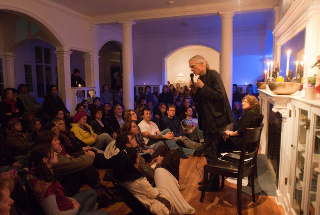 For nearly five years in the heart of New York’s gallery district, CoSM was home to Alex Grey’s collection of mystic art, his acclaimed Sacred Mirrors, and the MicroCoSM gallery featuring exhibits by diverse contemporary sacred artists. A bare loft had been transformed into sacred space; and a community was formed to build the Temple. Building an enduring sanctuary of visionary art to inspire every pilgrim’s creative path and embody the values of love and integral wisdom is the mission of the Foundation for the Chapel of Sacred Mirrors Ltd., a non-profit organization since 1996. The greatest sacred spaces have been created by the world’s religious communities. Offering spiritual teachings, practices, regular worship and sacramental ceremonies, the Foundation sought and received official recognition as a religion in 2008. 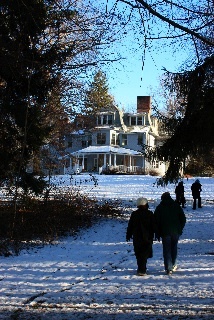 In February 2009, CoSM moved to its permanent home in the town of Wappinger, New York, 65 miles north of New York City. This 40-acre retreat is walking distance from the New Hamburg Metro-North station. Directions are available online. The Chapel of Sacred Mirrors offers full moon ceremonies, solstice and equinox celebrations, workshops and spiritual cultural offerings. Accomplished artists, musicians, dancers, authors, scientists and spiritual teachers share their talent and wisdom. An events calendar is available online. The 10,000 square foot Guest House features a newly restored library with brilliant acoustics, lovely fireplaces, a commercial kitchen and dining hall, lodging and hospitality. There is also a gift shop and café. The grounds have towering trees, spectacular foliage, widsom trails, reflecting pools, and sculpture. Visiting artists have blessed CoSM with labyrinths, gardens, and sculpture. 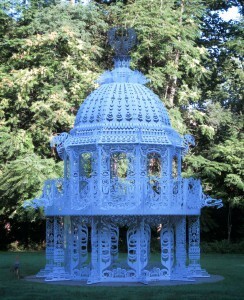 Kate Raudenbush’s Altered State two-story domed sculpture graces the meadow, a perfect setting for weddings and commitment ceremonies. The exhibition of Alex Grey’s Sacred Mirrors collection is in storage as the exhibition hall and grounds undergo massive renovations, with a planned opening date in Fall of 2015 or Spring of 2016. Please help us with your generous contribution during this crucial phase. Over the coming years, CoSM plans to develop a Temple complex with sculptural stations weaving a mythic narrative of humanity’s new relationship with Nature and Cosmos. Creativity is our spiritual practice. Please, co-create with us.